Kathleen Norris&apos;s masterpiece: a personal and moving memoir that resurrects the ancient term acedia, or soul-weariness, and brilliantly explores its relevancy to the modern individual and culture. 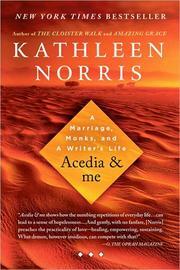 Acedia and me : a marriage, monks, and a writer&apos;s life / Kathleen Norris. Includes bibliographical references (p. -334). Christianity Today - Spirituality, 2009. $c Statement of responsibility Kathleen Norris. 246 VaryingTitle 3 $a Title proper/short title Acedia & me. 504 BibliogrphyNote $a Bibliography, etc. note Includes bibliographical references (p. -334). 505 ContentsNote 0 $a Formatted contents note Somewhere -- Tedium -- From eight bad thoughts to seven sins -- Psyche, soul, and muse -- Up and down -- Give me a word -- Acedia&apos;s progress -- Acedia&apos;s decline -- A silent despair -- The quotidian mysteries -- The "noon" of midlife -- Day by day -- And to the end arriving -- A widow&apos;s uneasy afterword -- Acedia: a commonplace book. 520 Summary $a Summary, etc. note Kathleen Norris&apos;s masterpiece: a personal and moving memoir that resurrects the ancient term acedia, or soul-weariness, and brilliantly explores its relevancy to the modern individual and culture. 541 Acq Source Note $a Source of acquisition Kathleen Szabo. 542 Acq source $a Source Szabo, Kathleen. 586 Awards Note $a Awards note Christianity Today - Spirituality, 2009. 650 Subj:Topic 0 $a Topical term Acedia. 650 Subj:Topic 0 $a Topical term Monastic and religious life.